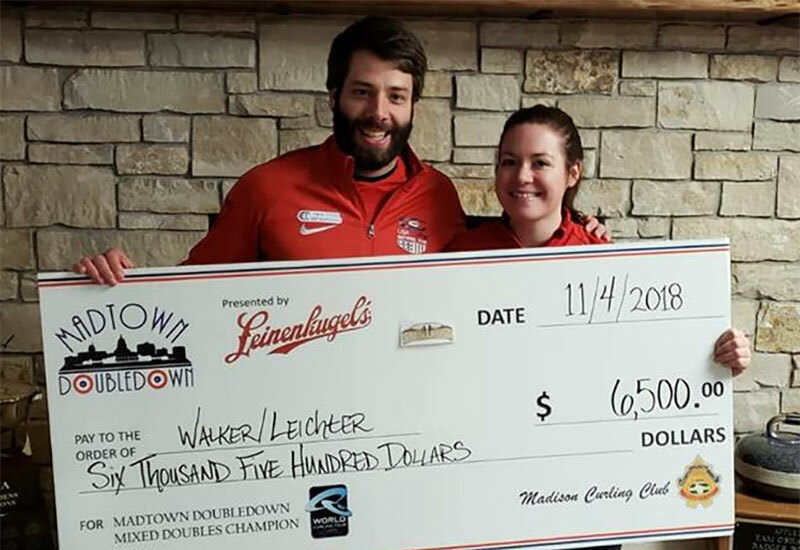 Monica Walker/Alex Leichter (Boston, Massachusetts) wins the MadTown DoubleDown presented by Leinenkugel's, defeating Shannon Birchard/Catlin Schneider (Winnipeg, Manitoba) 6-5 at the Madison Curling Club in McFarland, United States. Walker/Leichter take home the $8,518CDN first place cheque, while Birchard/Schneider receives $5,897CDN for their second place finish. The MadTown DoubleDown is a new tournament added to the ISS World Mixed Doubles Curling Tour this season after increased interest in the discipline of Mixed Doubles with Madison also being the home of USA Mixed Doubles team of Becca and Matt Hamilton. Starting with hammer, Walker/Leichter scored 2 in the first end, Birchard/Schneider responded in the second end scoring 3. Walker/Leichter scored 3 in the third end, with Birchard/Schneider scoring2 in the fourth end to tie the game at 5. Walker/Leichter scored a single in the fifth end for the 6-5 win. In the semifinals, Walker/Leichter defeated Jamie Sinclair/Sean Beighton (Blaine, Minnesota) 7-1 and Birchard/Schneider defeated Chelsea Carey/John Morris (Calgary, Alberta) 8-7. Carey/Morris and Sinclair/Beighton earned $3,276CDN for their semifinal finishes. In the quarterfinals, Walker/Leichter defeated Vicky Persinger/Christopher Plys (Fairbanks, Alaska) 7-3, Birchard/Schneider defeated Sarah Anderson/Korey Dropkin (Minneapolis, Minnesota) 7-4, while Carey/Morris defeated Em Good/MacAllan Guy (Seattle, Washington) 9-2 and Sinclair/Beighton defeated Ildiko Szekeres/Gyorgy Nagy (Budapest, Hungary) 9-4. Persinger/Plys, Szekeres/Nagy, Taylor Anderson/Derrick McLean (Blaine, MN) and Good/Guy earned $1,311CDN for their quarterfinal finishes. Walker/Leichter went 3-0 in the 18 team triple knockout qualifying round. In their opening game, Walker/Leichter defeated Nina Roth/Kroy Nernberger (Madison, Wisconsin) 8-7, then won against Becca Hamilton/Matt Hamilton (McFarland, WI) 9-4 to advance to an A-Qualifying game where they won against Szekeres/Nagy 8-4 to advance to the playoff round.